Located on the strip, Ballys Las Vegas is an art-deco style hotel in Las Vegas. Situated in the downtown, this landmark casino hotel is present behind the grand bazaar shops. Present in the heart of the city, the hotel is accessible via a sidewalk. Class and convenience are two things you can expect at this hotel. Surrounded by cascading fountains and towering buildings, this iconic hotel features upscale rooms that are equipped with a number of amenities including work desks, fridges and free Wi-Fi. Additionally, in the suites, you will find dining tables and whirlpool tubs. Also, the hotel features Pent houses that come with a wet bar. At the hotel, you can avail a number of facilities and recreational options. Notable features of this hotel include the onsite Casino and restaurants. 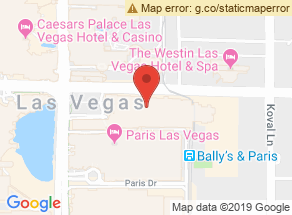 For a fine dining experience at the hotel, visit the Bally’s steakhouse for scrumptious steaks, Tequila Tequila for Mexican food or Ichiban Sushi for specialty rolls. Also, at the Buca Café Italiano, you can enjoy an all-day buffet. The onsite Casino features a wide variety of games and classic Vegas showgirls. You’re bound to have a good time at Towering neon columns, 200-foot people movers and cascading fountains entice guests inside the landmark resort. Great location near the airport. Central location with great sightseeing, dining out and shopping. Pricey, inconvenient parking. Reasonably accessible by car. Okay beds and somewhat clean, big rooms with excellent views. Bathrooms are large but with substandard cleaning. Outdated rooms with low rated balconies and lacking maintenance. Kitchenette, minibar, A/C and furniture not great quality. Shower can be a problem. Standard TV. Fairly good value for money. Internet is affordable. Food is a bit overpriced. Acceptable breakfast prices. Standard beverage prices. General service, restaurant service and reception are decent. Friendly service, but poorly rated management. Average bar service and housekeeping. Room service could have been improved. Recreation staff is nice. Concierge service is average. Hotel security can be an issue. Valet service could be better. Shuttle service can be an issue. Service at the pool/beach should be improved. Pool should be renewed. Moderately clean pool area.